Your baby’s sleeping habits will change as they grow. Sometimes they will sleep a lot, sometimes, not so much. You can help your baby get the sleep they need, and get more sleep yourself, by learning how to establish a good nighttime routine early on. Your baby’s first few months can wear you both out—it’s normal. 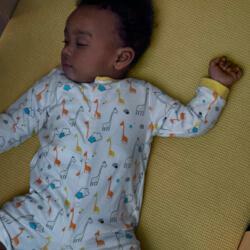 Learn tips to help you both get more sleep, while nurturing their healthy development. As your baby grows, they’ll start to understand the difference between night and day, and should start sleeping through the night. If not, our routine and tips can help. Growing toddlers need plenty of rest to stay happy and healthy. Here are a few tips to help them get enough sleep. We know trying to help your baby fall asleep can sometimes be a struggle. So we developed a 3-Step Routine that’s been proven to help your baby sleep better and longer, while making bedtime mean more. The makers of JOHNSON’S® understands that a good night’s sleep for your baby can mean a good night’s sleep for you. That’s why we have created a FREE baby sleep app at your fingertips.